Mercedes Ireland has confirmed that it's embarking on a 'product offensive' for 2019, in the form of launching eight all-new cars and seven facelifts of existing models, during the course of the year. That all kicks off in January, with the updated C-Class range, which is already in Ireland, but which gets its 'official' launch in the new year. In February and March, the new offshoots of the A-Class's front-wheel-drive platform will arrive - the A-Class saloon and the B-Class MPV. You want more front-drive Merc action? You got it, because from April to June, we'll see the arrivals of the new CLA four-door 'coupe' and the CLA Shooting Brake sports estate. If you're after something a little more traditional, the new GLE SUV arrives around the same time to take on the new BMW X5 and the Audi Q7. This time around it'll come with a seven-seat option, too, which should improve sales a bit. OK, so maybe you fancy something that's properly ground-breaking. How about the new EQC? That's the first car from Mercedes' new all-electric sub-brand, and it's an SUV rival to the likes of the Audi e-tron and the Jaguar I-Pace. July and September will see the arrival of the new GLS; that's a bigger, grander, more luxurious offshoot of the GLE and a rival to the 'full-fat' Range Rover. This time around, it will come with a max-lux Maybach variant. There'll be facelifts for the GLC and GLC Coupe at the same time. 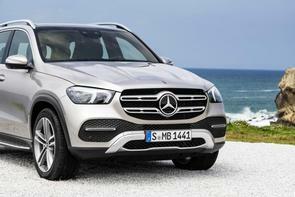 In October, we'll get one of Merc's most anticipated new cars - the GLB. This will be a compact SUV, based on the B-Class platform, but which promises to bring the chunky, square-edged styling of the the famous G-Wagen to a more affordable level.